Beidh an Chomhairleoir Diarmaid Ó Cadhla, agus beirt chomhghleacaithe leis, Tom O’Connor agus Tony Walsh, ós comhar na cúirte den tarna uair i gCorcaigh an tseachtain seo chugainn de bharr gníomh díreach ar chomharthaí sráide a rinne siad i Mí Feabhra. Tá an triúr mar bhaill de Feachtas Comharthaí Sráide Chorcaí a rinne comharthaí ar a bhfuil ainm an Banríon Victoria luaite a scriosadh ag tús na bliana. Tá an stát tar éis na fir a chúiseamh as damáiste coiriúil a dhéanamh. 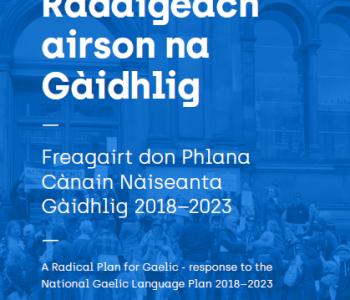 D’iarr Ó Cadhla go reáchtálfar an triail trí Ghaeilge, ach dhiúltaigh an breitheamh dó. I ráiteas a d’eisigh an grúpa ar an gcéad uair sa chúirt dóibh an tseachtain seo chaite, dúradar gur easumhlaíocht shibhialta a bhí sa mhéid a rinne siad. Anuas air sin, dúradar gur masla é d’íospáirtigh An Ghorta Mhóir, agus d’fhéinmheas mhuintir na hÉireann, é ainm Victoria, ‘Banríon an Ghorta’, bheith ar chomharthaí sráide na tíre. ‘Mar sin, luíonn sé le ciall gur chóir do mhuintir na tíre ár ndícheall a dhéanamh an damáiste sin a aisiompú, ach go háirithe i bhfianaise an mheoin choilínigh atá fós láidir go leor sna ranna stáit a mbíonn ag plé lenár dteanga náisiúnta. 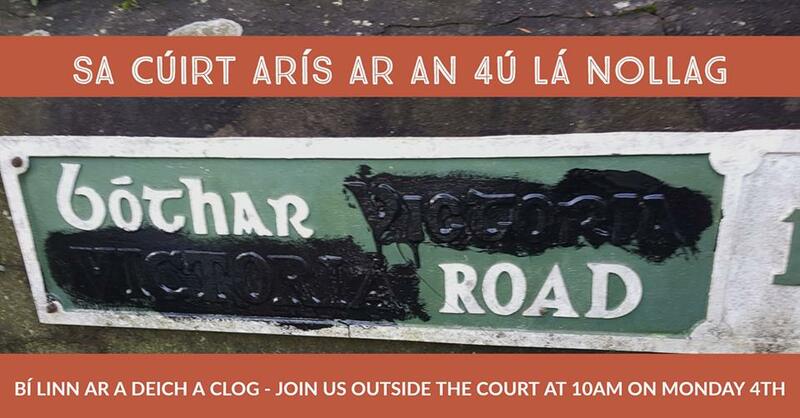 Councillor Diarmaid Ó Cadhla, and two colleagues, Tom O’Connor and Tony Walsh, will appear before the courts in Cork for the second time next week due to a direct action taken by them in relation to street signage last February. The three are members of Cork Street Names Campaign who damaged signs with Queen Victoria’s name on them at the beginning of the year. The state has charged the men with criminal damage. Ó Cadhla requested that the subsequent trial be conducted through Irish, but the judge dismissed his request. In a statement the group released last week on their first court appearance, they noted that they had carried out an act of civil disobedience. Moreover, they said that it was an insult to the victims of the Great Famine, as well as being an insult to the self-respect of the Irish people, that Victoria’s name, the name of the ‘Famine Queen’, should still adorn street signs in the country. ‘One of the major objectives of our organisation is to put into motion a process of decolonisation in Ireland. Language, symbols and history are powerful, as we know. The colonists did their level best to eradicate and Anglicise our ancient place names and on some occasions in their stead insert the names of their kings and queens. ‘Therefore, it stands to reason that the people of the country should do their level best to reverse this damage, especially in light of clear evidence that the colonial mentality still persists with some vigour in the state departments which deal with our national language.